Researchers at MIT’s Computer Science and Artificial Intelligence Laboratory (CSAIL) have developed eight autonomous flying robots that are also capable of driving on land. In addition to flying and driving on land, the autonomous robots can also communicate with each other – which ensure that they do not collide. Maneuvering on land, flying and communicating are second nature to birds and insects. While airborne drones are fast and agile, they cannot maneuver on the ground. “The ability to both fly and drive is useful in environments with a lot of barriers, since you can fly over ground obstacles and drive under overhead obstacles,” Ph.D. student Brandon Araki, lead creator of the new autonomous robots, told MIT News. The eight autonomous flying, driving and communicating robots were developed based on the previous work of Araki called “flying monkey” robot. Araki’s previous robot can walk, crawl, grasp and fly. The previous robot, however, cannot travel autonomously. In order for the new robots not to collide with each other, MIT researchers developed various “path-planning” algorithms. 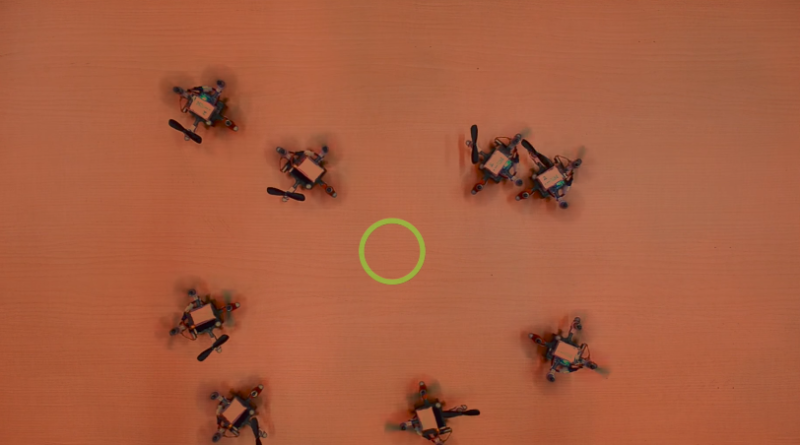 To enable the new robots to drive on land, the researchers put two small motors with wheels on the bottom of each robot.